It's been a busy summer so far! Our friend Petie was visiting from Australia, so we showed him the sights around town, took him to the ARGRA rodeo, and hiking in Jasper for Canada Day. So, there's been a whole lot of driving! But this weekend I was more than happy to make the trek down to Calgary so that the fella and I could see Evil Dead: The Musical. The show was at The Playhouse in Vertigo Theatre Centre, right at the base of the Calgary Tower. 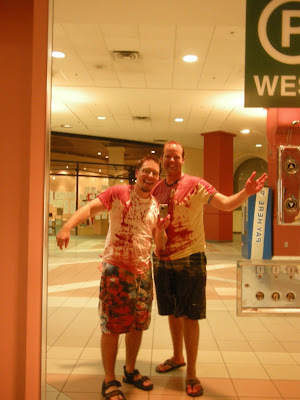 We had tickets for the Splatter Zone, and there was a whole list of rules the staff made sure we knew about: no leaving your seat after intermission, no going back to the main lobby after the show, wait for the usher to take you out the back way... it seemed like some pretty serious stuff. And boy, did we find out why! The show itself was awesome!! The actors were great, the set was spooky and hilarious at the same time, and they couldn't have picked a better guy to play Ash. There were some really funny parts in the songs, and the music was upbeat and kept everybody wanting more. There were some really cool puppetry special effects, including a talking moose and dancing beaver, and a few quick-switch moments where I had no idea how they substituted a fake head on a shelf for an an actor's real head without me noticing. 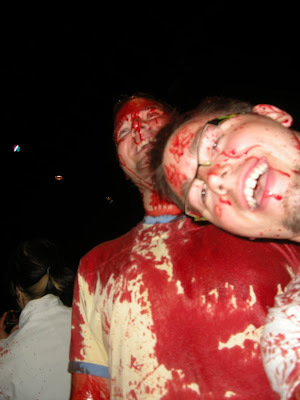 But coolest and most fun effect was, of course, the blood splatter! 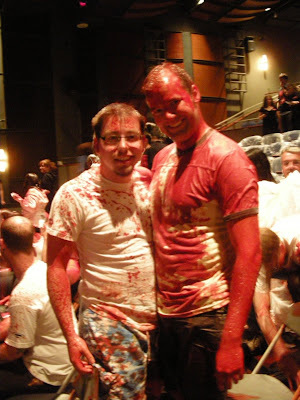 It started out with a burst of blood flying at the audience from the cellar door, and by the time they were done we had seen blood flying at us from all directions... including the actors gushing blood all over us as they walked through the aisles. Too cool!! The show is running for one more week, and if anyone hasn't seen it yet I'd highly recommend it! *With apologies to Blake for stealing his cool slogan. I'm sure he stole it from someone else anyway. I'm feral geographer, and I blog at http://feralgeographer.wordpress.com. Along with Mae Callen of Driving Fast On Loose Gravel, I'm creating an active blogroll of queer blogs from Canada and/or by Canadians. The project is called Queer Canada Blogs, and we've added your blog! Please check it out and let us know if you have any suggestions for other blogs we could add.